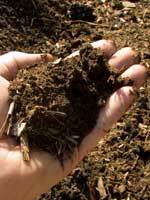 There are seven main compost requirements needed for really great compost decomposition. These requirements are compost size, air, moisture, fragment size, green matter, dry matter, and heat. Keeping these compost in mind will help to ensure a lot of humus and nutrient rich compost for your organic garden. For rapid decomposition, you need excellent ventilation for compost. If there’s not enough air (oxygen), then the decomposition process slows down, and you’ll get some bad odors-not good if you’re preaching "Organic" to everyone! Keep this in mind when selecting your compost structure. Moisture is very important for compost requirements, but not wetness. Balance is important here … not too much water or too little. In hot weather, it’s important to keep the compost moist. When there’s rain, protect the compost to prevent nutrients from leaching out and away. The effect that fragment size has on decomposition is much like the effect of throwing wood in a burning fireplace. Throwing (placing) a log in the fire doesn’t have an immediate reaction… it takes some time for it to really start burning. BUT if you throw a handful of fine-sawdust into the fire there is an immediate, and dangerous reaction - the sawdust almost instantaneously combusts! This reaction occurs, because the “surface area” of all the pieces of fine-sawdust together is significantly more than the surface area of the large log. Now how does this relate to compost requirements and fragment size? The smaller the fragment sizes, the faster the decomposition. Depending on your time, your budget and energy level, shredding leaves and branches may not be something you’ll want to do. Think of green matter and nitrogen as lighter fluid for your compost. Green matter has a significant amount of nitrogen, which speeds up compost decomposition. Typical sources of green matter are grass clippings, fresh green leaves, weeds. Sources of nitrogen are bloodmeal, organic nitrogen based fertilizers, rabbit, pigeon, cow and horse manure. I’m sure you can think of a lot more examples... just think “Green”. 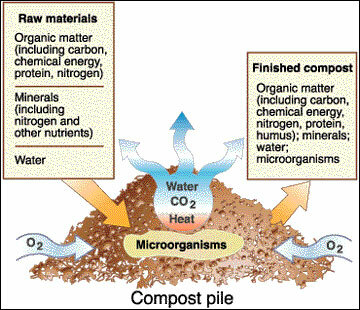 Healthy compost has balanced carbon to nitrogen ratio…this is not as complicated as it sounds. Dry matter helps increase the carbon base of your compost. Dry matter also helps absorb moisture and maintain compost porosity and structure. Good sources of dry matter for your compost pile are dry leaves, small dry twigs and shredded dry branches, paper towels & bags, cardboard, sawdust, wood ash, wood shavings, woody prunings, rodent bedding, old straw & hay, and paper based egg boxes. If you were to reach towards the inside of your compost pile, you’ll notice how hot it is. Decomposition in a compost pile can reach up to 140 degrees Fahrenheit (60 degrees Celsius) in the center. That’s hot! The advantage of this heat is that it will kill weed seeds and help sterilize your compost... and impress your friends and family. To keep the heat up you may want to experiment with using black plastic tarp. I use this during the winter months, and it helps contain the compost heat and keeps rainwater from over saturating it. Keep the ventilation in mind though.